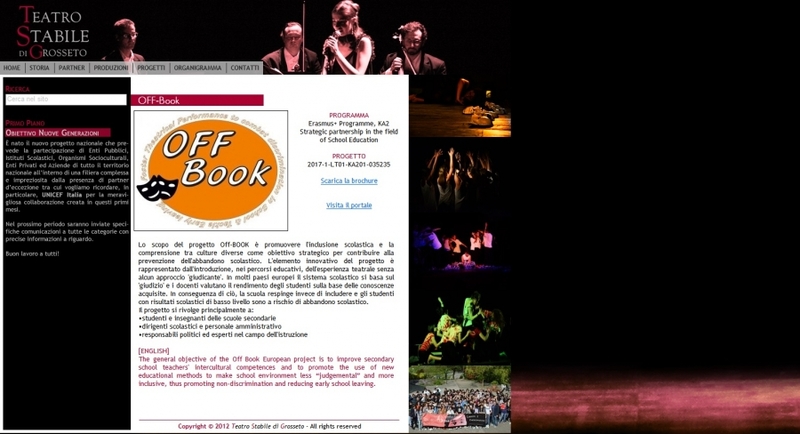 The OFF-Book project partnership made contacts with web sites focusing on the fields of education and performing arts. 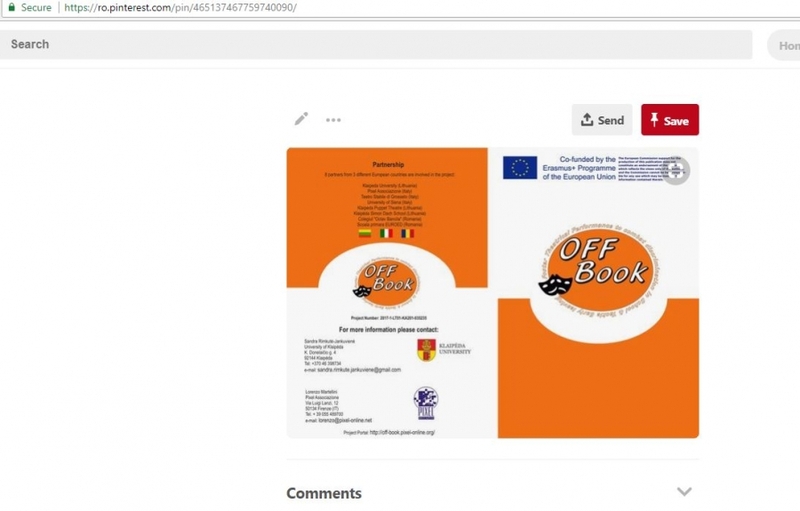 The OFF-Book project was presented to the web masters and a link to the OFF-Book project portal was made so that those who will access the selected web sites can also access, through a direct link, the OFF-Book portal. 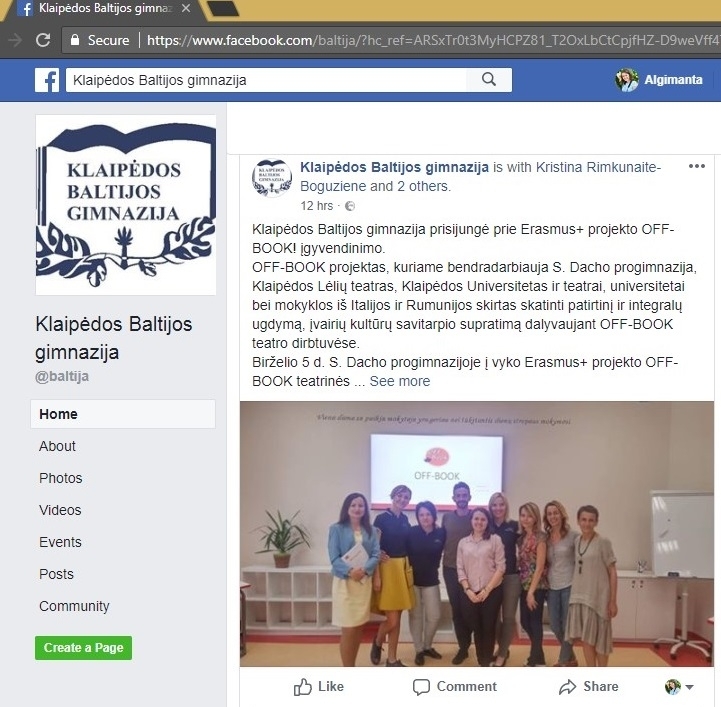 Klaipeda Aukuras Gymnasium is associated partner in the OFF-Book project. Pixel website provides information about the project together with a direct link to the Portal. There are many users of gymnasium website that may now learn about and benefit from the OFF-Book project. KPSCK is partner in the OFF-Book project. KPSCK website provides information about the project together with a direct link to the Portal and for links to the Guidelines in Lithuanian. There are many users of KPSCK website that may now learn about and benefit from the OFF-Book project. 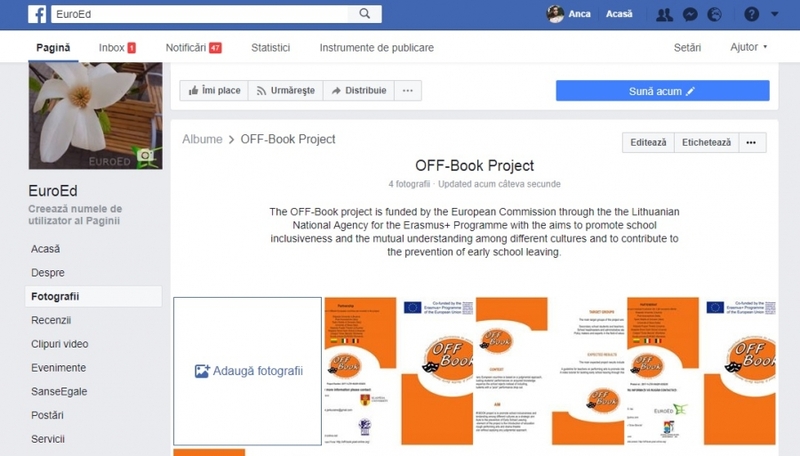 [email protected] is one of OFF Book Associate Partner, the association helps UniSi to disseminate the project activities at youth level mainly through its social networks. 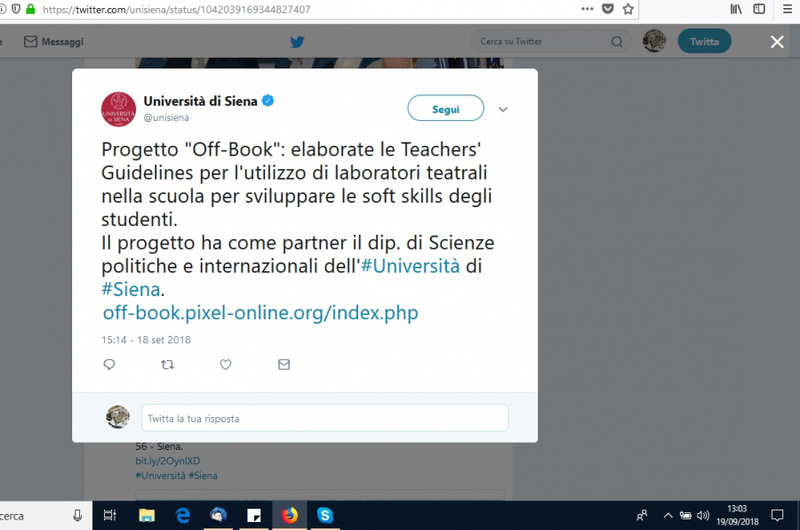 In particular the Association supports an Italian Language course for foreigners and organizes an intercultural laboratory based on non-formal methodologies called “Laboratorio Meticcio”. REDU is one of OFF Book Associate Partner, the association helps UniSi to disseminate the project activities at its network of educators, who have a specific interest in informal & non formal education. REDU co-operates with the Council of Europe (for the COMPASS project) and Amnesty International (with special regard to bullying issues). Through REDU Portal OFF Book will be reaching educators in European and non European countries. Prof. A. Viviani (UniSi Team Co-ordinator) announces the 22,000+ followers of UniSi on Facebook that IO1 is available on line at the project portal. Prof. A. Viviani (UniSi Team Co-ordinator) announces the 1,000+ followers of UniSi on Twitter that IO1 is available on line at the project portal. Prof. A. Viviani (UniSi Team Co-ordinator) announces the academic community of the Dept. of Political & International Science that IO1 is available on line at the project portal, both in English & Italian. Klaipeda Puppet Theatre is a partner in the OFF-Book project. This website provides information about the project together with a direct link to the Portal. There are many parents, school partners visiting this site, so the information about OFF-BOOK is being spread. 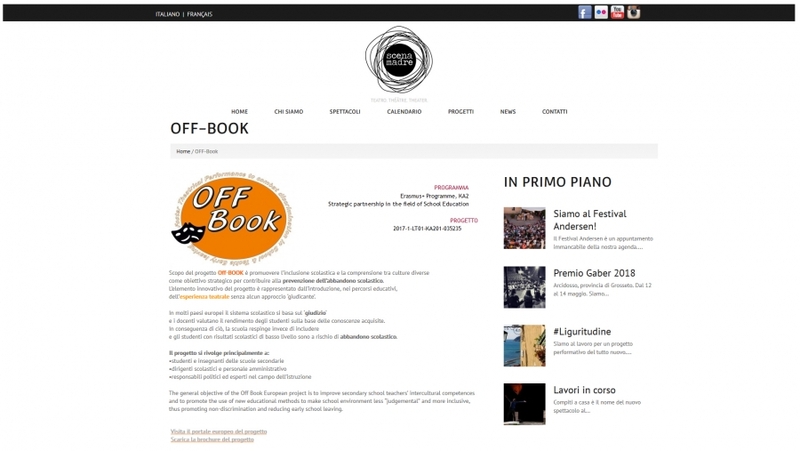 Teatro Stabile di Grosseto is partner in the OFF-Book project. TSG website provides information about the project together with a direct link to the Portal. 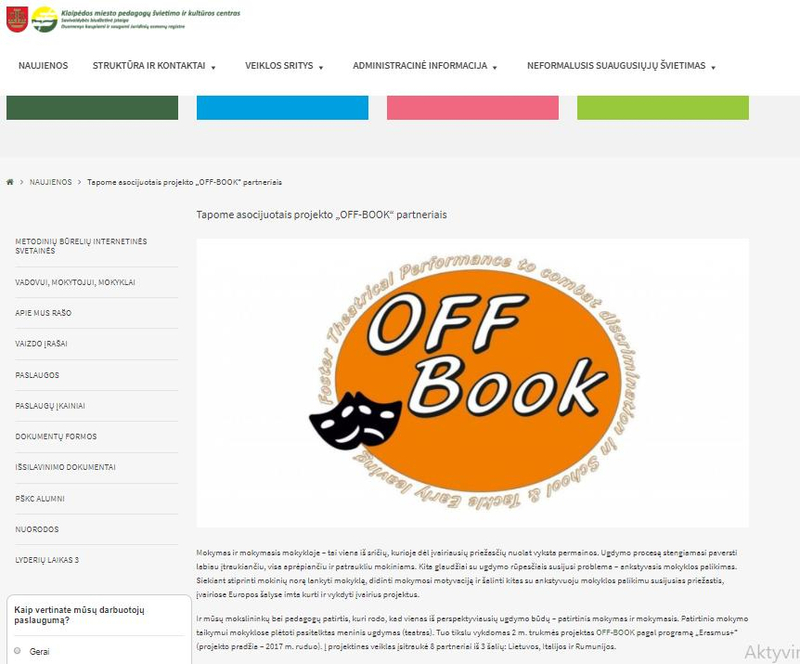 There are many users of TSG’s website that may now learn about and benefit from the OFF-Book project, in particular teachers, other people working in the world of school and theatre educators and operators who in turn can disseminate the new educational methods promoted by the OFF-Book project throughout their activity. ScenaMadre is associated partner in the OFF-Book project. ScenaMadre website provides information about the project together with a direct link to the Portal. 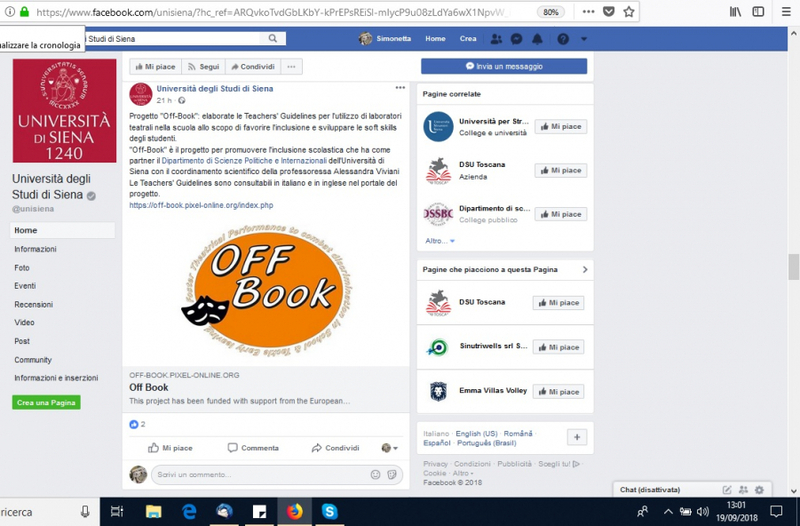 There are many users of ScenaMadre website that may now learn about and benefit from the OFF-Book project, in particular teachers, other people working in the world of school and theatre educators and operators who in turn can disseminate the new educational methods promoted by the OFF-Book project throughout their activity. Ordinesparso (NIN nuove interpretazioni) is associated partner in the OFF-Book project. NIN website provides information about the project together with a direct link to the Portal. 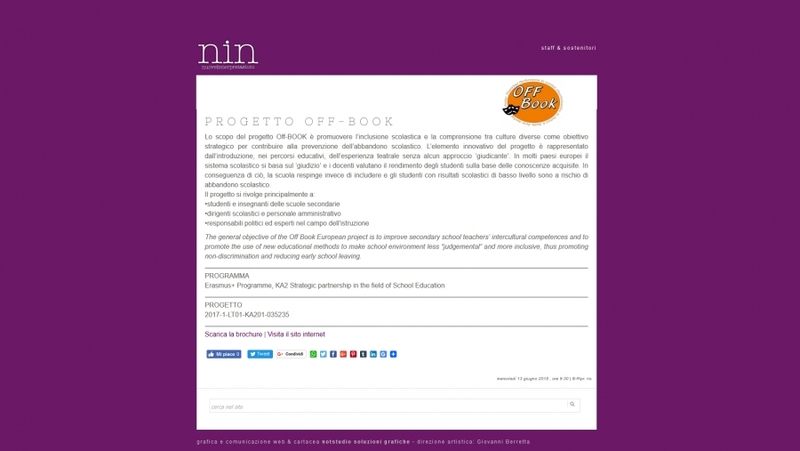 There are many users of NIN website that may now learn about and benefit from the OFF-Book project, in particular teachers, other people working in the world of school and theatre educators and operators who in turn can disseminate the new educational methods promoted by the OFF-Book project throughout their activity. 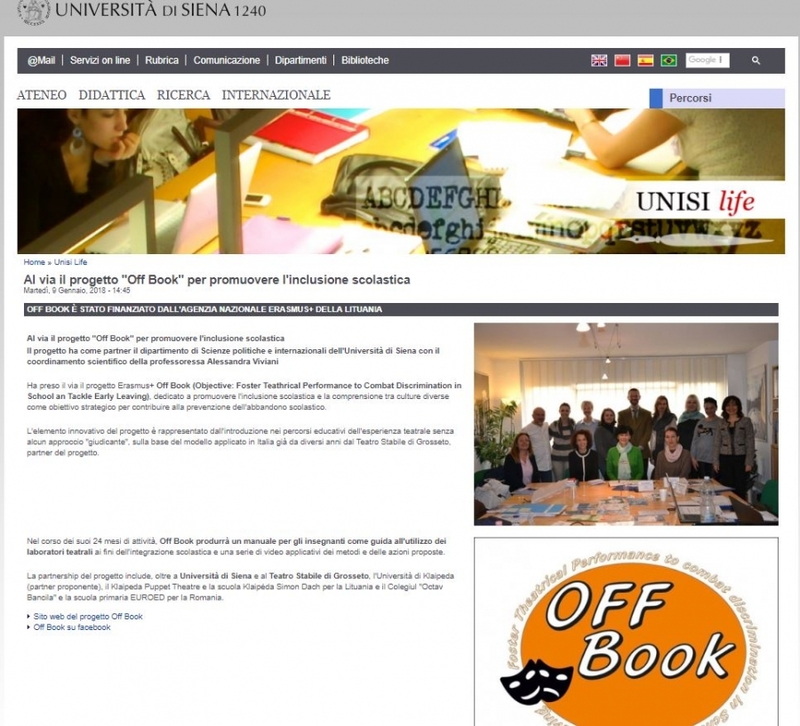 Livello 4 is associated partner in the OFF-Book project. Livello 4 website provides information about the project together with a direct link to the Portal. 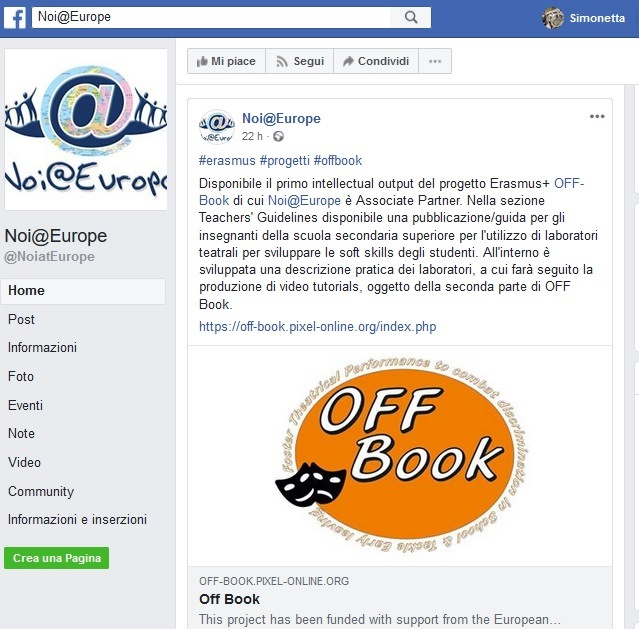 There are many users of Livello 4 website that may now learn about and benefit from the OFF-Book project, in particular teachers, other people working in the world of school and theatre educators and operators who in turn can disseminate the new educational methods promoted by the OFF-Book project throughout their activity. Geometria delle Nuvole is associated partner in the OFF-Book project. Geometria delle Nuvole website provides information about the project together with a direct link to the Portal. 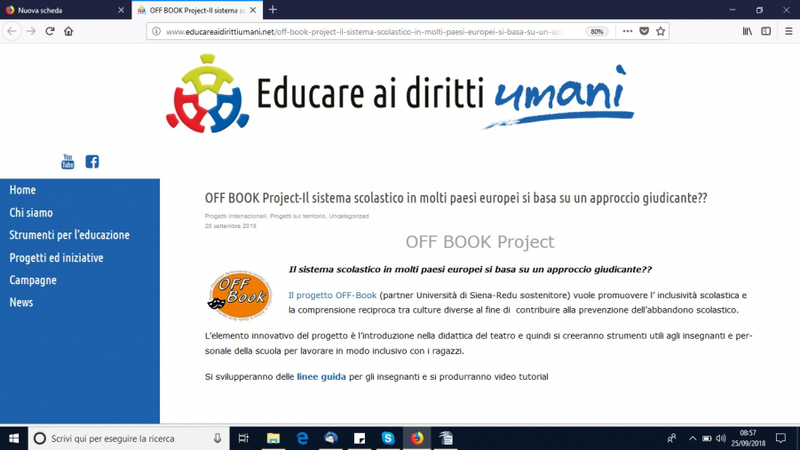 There are many users of Geometria delle Nuvole website that may now learn about and benefit from the OFF-Book project, in particular teachers, other people working in the world of school and theatre educators and operators who in turn can disseminate the new educational methods promoted by the OFF-Book project throughout their activity. 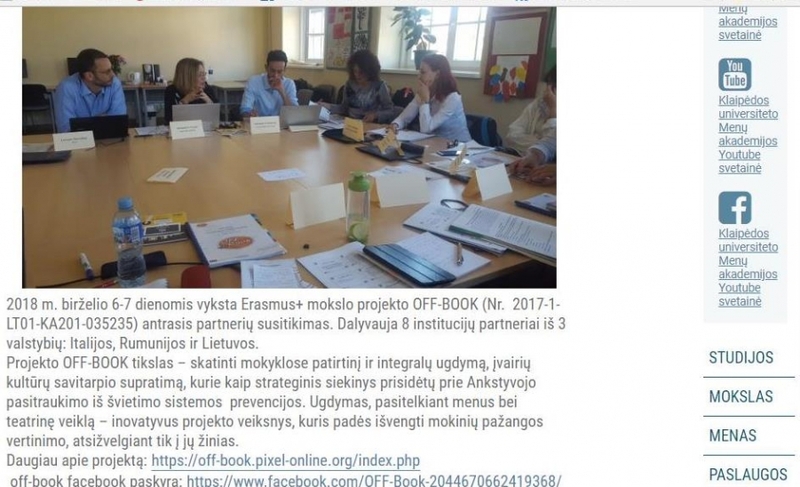 The information about the Off-Book project second partner meeting is provided in the blog of Klaipeda University. Information provided here: a second meeting photo, a project brochure, and a link to the project's website. The website of Klaipėda University Academy of Arts provide the information about the institution and the events as well. In this link is the information about the second partner meeting provided. 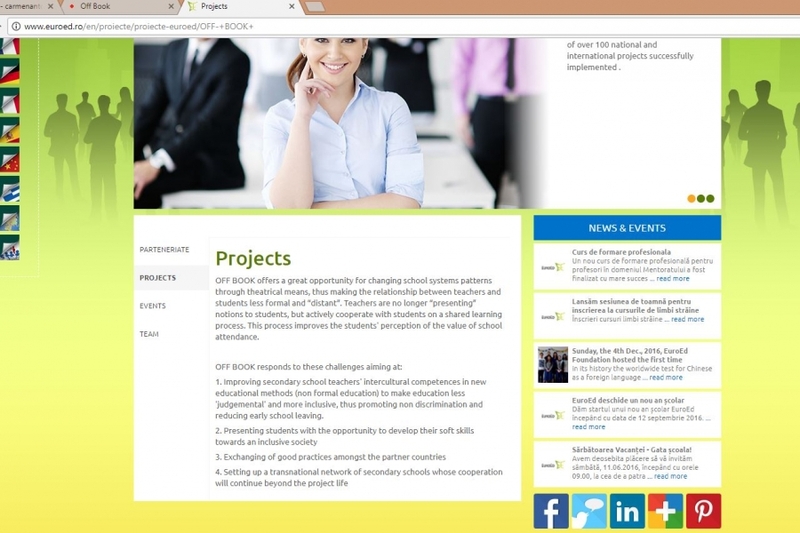 Liudvikas Sultpinas progymnasium is one of the OFF-BOOK project partners. There are one teacher joining this project and fifteen students participating in theatre workshops. Baltija gymnasium is one of the OFF-BOOK project partners. There are three teachers joining this project and fifteen students participating in theatre workshops. Klaipeda Sendvaris progymnasium is one of the OFF-BOOK project partners. There are four teachers joining this project and thirteen students participating in theatre workshops. Klaipeda Verdene progymnasium is one of the OFF-BOOK project partners. There are two teachers joining this project and fifteen students participating in theatre workshops. Education Development Centre (EDC) is the biggest institution affiliate to the Ministry of Education and Science of the Republic of Lithuania providing educational support in the field of pre-school, primary and general education. EDC staff consists of more than 100 professionals in education. 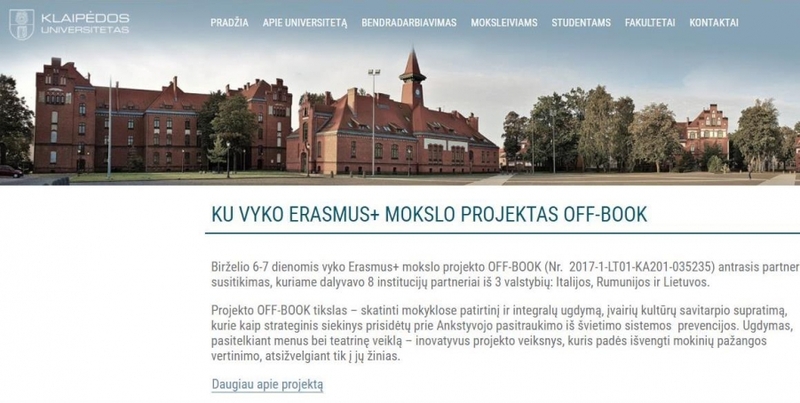 Klaipėda University is the partner of the Off-Book project. The website of Klaipėda University Academy of Arts provide the information about the institution: main information for the students and for other interesting in history, structure, art and science activities, projects and events). OFFBOOK project and community has been linked with the Glottodrama project, which aims is to teach foreign languages by integrating the communicative approach alongside with theater techniques. Glottodrama is the result of 3 European projects launched since 2008 through the European Commission's Lifelong Learning Program. In present, Glottodrama project and method lives through the Glottodrama Academy (Via dell'Università,16/D, Fermo, Italy) and through the international association: EUROPEARLL, European Association for Performing Arts Applied to Language Learning: www.europearll.eu. Google+ launched in June 2011. Features included the ability to post photos and status updates to the stream or interest based communities, group different types of relationships, into Circles, a multi-person instant messaging, text and video chat called Hangouts, events, location tagging, and the ability to edit and upload photos to private cloud-based albums. 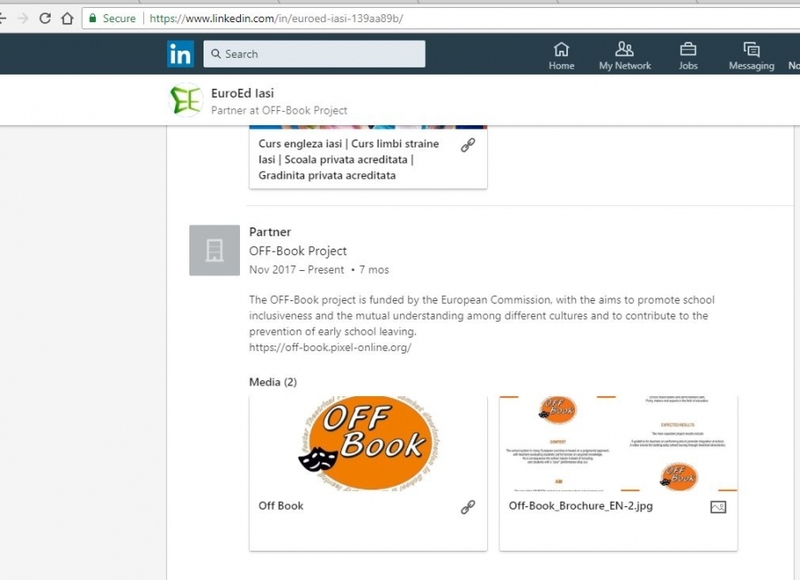 The OFF-Book project has been included among the network of users that are accessing Google+. Pinterest is a web and mobile application company that operates a photo sharing website. Pinterest acts as a personalized media platform, offering the opportunity to share information from various domains, including education and projects. The OFF-Book project has been included among the network of users that are accessing Pinterest. LinkedIn Corporation is a social networking website for people in professional occupations. Founded in December 2002 and launched on May 5, 2003 it is mainly used for professional networking. LinkedIn reports more than 200 million acquired users in more than 200 countries and territories. On EuroEd account, OFF-Book project has been distributed among the network. Twitter is an online social networking service and microblogging service that enables its users to send and read text-based messages on various subjects. Creating a very complex network you can use Twitter for sharing and disseminating projects. The OFF-Book project have been shared ensuring this way its visibility also to other countries. EuroEd Facebook Page is an online community of over 2000 permanent viewers. 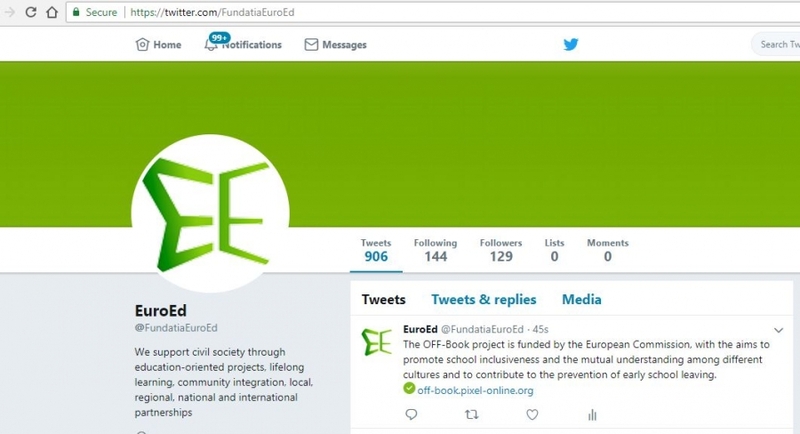 The people intrested in the EuroEd activities can access the institutional Facebook page and can read about the projects, including OFF-Book project (info about the project, news, events, photos from the activities, etc.). Also on the official EuroEd Facebook Page visitors can find a photo album dedicated to the OFF-Book project. 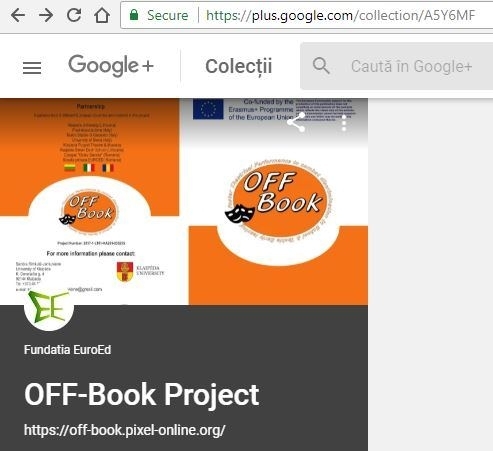 EuroEd is partner in the OFF-Book project. EuroEd website provides information about the project together with a direct link to the Portal. 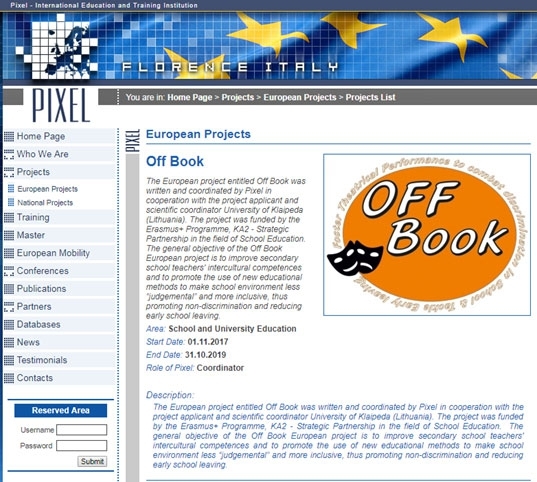 There are many users of EuroEd’s website that may now learn about and benefit from the OFF-Book project. 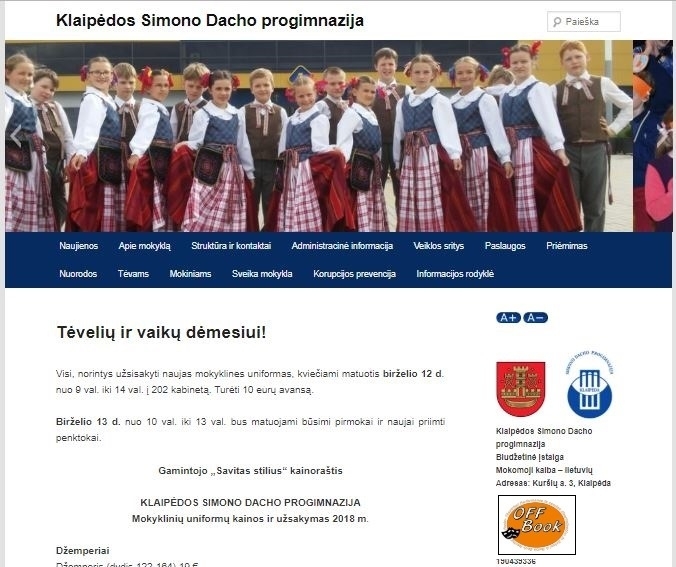 Simon Dach progymnasium is a partner in the OFF-Book project. This website provides information about the project together with a direct link to the Portal. There are many parents, school partners visiting this site, so the information about OFF-BOOK is being spread. 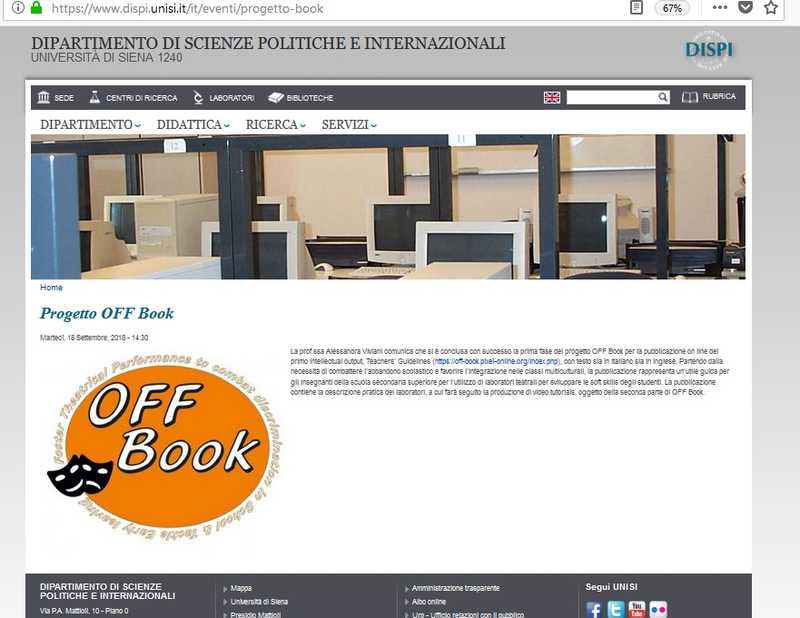 Simon Dach progymnasium is a partner in the OFF-Book project. This website provides information about the project together with a direct link to the Portal. 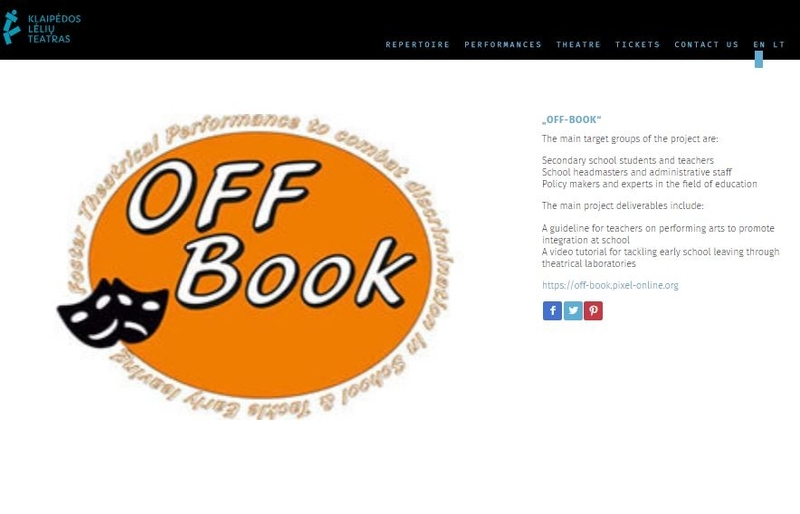 There are many parents, school partners visiting this site, so the information about OFF-BOOK is being spread. Colegiul National de Arta “Octav Bancila” is partner in the OFF-Book project. CNAOB website gives general information about the project and a direct link to the OFF BOOK Portal, as it can be seen on the pdf page link of the school website. There are many users of CNAOB’s website who can learn about the development of the project, its intellectual outcomes thus benefitting from the OFF-Book project. Pixel is partner in the OFF-Book project. Pixel website provides information about the project together with a direct link to the Portal. There are many users of Pixel’s website that may now learn about and benefit from the OFF-Book project.